I Like the nature trail that is near by, and firepits. It's easy to walk around and just relax after long days of excitement. Pictures are not accurate it. Rooms need to get updated and matresses as well. The hotel looks old. Breakfast area is the only good looking area. Staff is friendly and its clean. Motel style, old and cheap. Fair for the price. We didn't like the noise late at night. We woke up at least three times on the first night with people talking loud, wheel suitcases noise and cars parking. The outdoor facilities were awesome!! All the staff were super!! I was waoken at 12am by children running outside the rooms.In addition to this, other visitors were using the laundry at 1am that caused additional noise. I think the quality of the room reflects it's price but they need to have staff walk the premise to ensure that quietness is enforced at least after 11pm. The room had an unbearable bleach smell! It was hard to sleep and gave us incredible headaches. Also the restaurant and bar closed quite early so we were unable to get food when we arrived aftwr the park. Limited television channels available. Front desk staff was very friendly, only positive to this stay. Nice hotel close to everything and was very quiet during my stay. 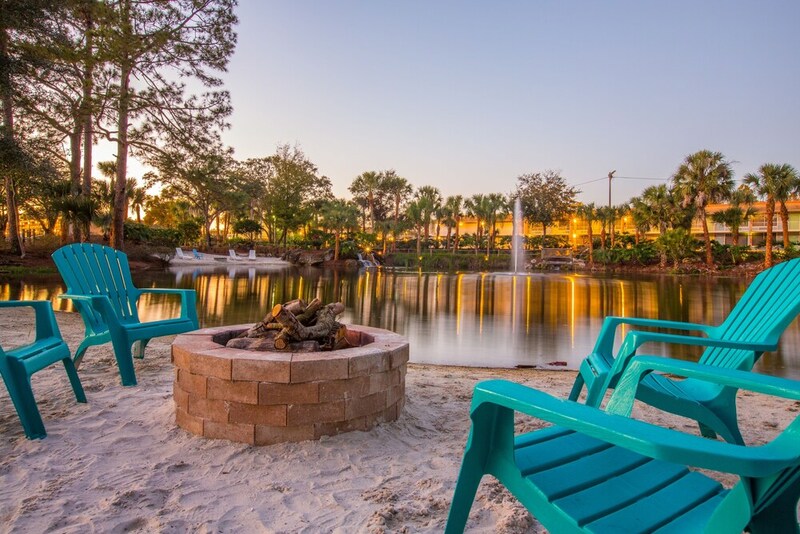 Located in West Kissimmee, Champions World Resort is 6.4 mi (10.3 km) from Disney's Animal Kingdom® Theme Park and 7.7 mi (12.5 km) from Old Town. This 435-room, 3-star resort welcomes guests with 2 outdoor pools, a restaurant, and an indoor pool. Enjoy a bite to eat at the resort's restaurant, or relax with a drink at the bar/lounge. Start each morning with buffet breakfast, available for a fee from 6:30 AM to 10:00 AM. A 32-inch LCD TV comes with satellite channels, and guests can stay connected with wired Internet and free WiFi. The bathroom offers hair dryers and free toiletries. Other standard amenities include a refrigerator, a microwave, and a coffee maker. At Champions World Resort, guests enjoy 2 outdoor pools, an indoor pool, and a children's pool. There's free parking and a free theme park shuttle. The front desk has multilingual staff standing by 24 hours a day to assist with concierge services and luggage storage. Other amenities at this family-friendly resort include a fitness center, a spa tub, and free WiFi in public areas. Thank you for your constructive feedback. It is regrettable to read that your stay with us did not reflect the value that we are known for here in Orlando. While our accommodations may be a little older, we strive to provide convenient affordability for every guest. Our maintenance team has been dispatched to conduct a full evaluation. Please accept our apologies and allow us the chance to make it up to you in the future. We would love to serve you again. Thank you for paying us a visit. We value your constructive insight and regret that your stay did not meet your expectations in every respect. Thank you for identifying that issue with your bed. Our team will take a look to ensure that we continue to provide experiences that our valued guests can depend on. When your travels bring you back to our fantastic location, we look forward to exceeding your expectations with a superior stay. Choose us! Thank you for taking a moment to share your experience. While we're happy to hear that you took advantage of some of the highlights of our awesome property, we are sorry that your room did not match your tastes. Our goal is to deliver affordability that does not cut corners in comfort, and we appreciate the constructive thoughts you shared. With a variety of rooms available here on-site, we know that we have the perfect choice for you. Come back and see us again for an even better stay! Thank you very much for choosing Champions World Resort! We are so glad to hear that you enjoyed the nature trails and fire pits after a long day of activity. Thank you very much for sharing your thoughts, and we hope to see you again soon! Buffet breakfast is served daily from 6:30 AM to 10:00 AM for a fee. Frazier Place - Restaurant and bar specializing in American cuisine and serving breakfast, lunch, and dinner. The resort has 2 outdoor swimming pools and an indoor pool. A children's pool, a spa tub, and a fitness center are other recreation options.